Today I was able to tell a student “Yes, I can sponsor the up-cycling club you want to start.” I was able to connect another of our students who needed support with a like-minded teen on the other side of the country. I was able to tell a new student who was visibly distressed about something going on at home that I would always be there to be a listening ear whenever she was ready to talk because I noticed something was off in her demeanor in our media class. A student in In-School Suspension (ISS) had his hood over his head with an obvious chip on his shoulder. After a short chat and telling him I believed he could do better, the hood was off and his entire body language changed. A new teacher came to ask me about two young men who got into a scuffle in her classroom and I had the privilege of changing her mind about the two, as she was obviously frustrated with their actions. She’s planning to take a closer look into the backstory and what circumstances led to this unforeseen hostility in the boys when they return to school. Today was a good day. Today I feel like I did some good in my little part of the world. Not every day is like today… but today was a good day. And I’m going to celebrate it. What allowed me to go from the crazy Chromebook lady from a few days ago in The Principled Principal by Jeff Zoul and Anthony McConnell blog to this? I was in the middle of reading the 41st book published by Dave Burgess Consulting, Inc which reminded me to Be The One For Kids! Ryan Sheehy shares how to be the one for kids in relation to culture, creativity, empowerment, and continued learning. This book wasn’t without some punches to the gut, though! Ryan speaks to being balanced. He tells a story of when he was interviewing for a position and told them that if they wanted someone to be there in the evenings, they needed to find someone else because he was going to be home with his family (paraphrasing his words, of course). He also speaks to being organized and flexible. At this moment, I am poorly organized at work, and at home. There are stacks of bills, papers, books, Lego bricks, etc piled up on nearly every surface I see from here. I know a big portion of my stress can be attributed to the mess around me. I function much better when I am organized. The disorganization is also a sign of the lack of balance in my life at this point. It seems like I never slowed down this summer for the annual “get my life back in order before school starts” house cleaning party. You educators know exactly which one I’m referring to! With these two hitting me the hardest while reading, I have no choice but to make these my implementation plan! It was a fairly easy decision. Next week I will be shadowing students and cannot wait to spend a few days in the life of a middle school student! I will choose students purposefully with the goal of being in every classroom and shadowing a variety of skill sets. This gives me time to get organized again at work as well. I will not have classes to plan for, so I can spend my afternoons finishing up many of the projects I have floating around the media center and in my Cloud. My other implementation feels like I’m cheating because it was booked a long time ago. In July 2017 when the new itineraries for Fall 2018 came out, my husband and I booked a Disney Cruise for our family. We kept this a secret for almost a year. We’ve been saving since our last Disney Cruise (multiple years ago) and despite purchasing a new home and more medical bills than we ever expected, we were able to book this cruise for November 2018. We will be enjoying all the magic Disney has to offer on our 7-night adventure. Because we booked early (and I scoured the Disney Moms website) we were able to book a massive balcony (about three times the size of the oversized verandah we had on our last cruise) and just booked a few excursions while in the Caribbean. This is going to be my balance time. I am very much looking forward to turning off all devices and disappearing for a week, enjoying my family and spending some much-needed time away with them. My daughters certainly get the worst of me. By the time we get home, I am exhausted and the last thing I want is more questions and silliness. I certainly don’t want to do homework and review sight words or argue about whether the reading assignment is completed. I am excited to give them the BEST of me while we’re gone. We will have fun, relax, and they will get my undivided attention and I am so excited to spend this time creating memories with them! 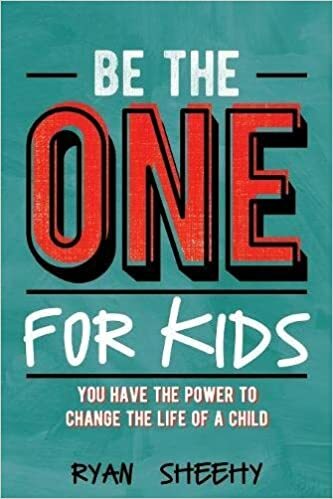 Be The One For Kids is an extraordinary book! It is inspirational and makes you want to do all you can to reach those kids that feel unreachable. I love Ryan’s passion and energy and I can’t wait to meet him one day! Every Wednesday night at 8:45 pm EST, Ryan hosts a fast and furious fifteen minute chat on each chapter of his book (currently on chapter 17 if you want to join tomorrow night)! You can join these chats (and follow along with educators every day of the week) by using the hashtag #BeTheOne. These chats are inspirational and allow you time to reflect on how to better serve your students. You don’t have to have read the book to be successful in the chat! Ryan hosts a fantastic website that you can access here. Ryan supports foster and homeless youth through the proceeds of t-shirt sales. (Another example of how fabulous the DBC, Inc authors are as humans!) You can order your t-shirt here (they run for a limited time each month). I definitely recommend the tahiti blue long-sleeved t-shirt with a hood. It’s SUPER soft! Ryan was a guest on multiple podcasts including the Teach Me, Teacher podcast (access parts one and two) and the Pondering Education podcast. He also chats with Teach Better Talk and #ShareMOEdu. He is constantly sharing amazing stuff on Twitter, so I’d definitely be sure to follow him at @sheehyrw! Definitely grab yourself a copy of his book Be The One for Kids! You won’t regret a second of reading his passionate words. His enthusiasm is contagious! Check out the flipgrid, a collaborative space for global reflections on each DBC, Inc book and share your thoughts on Be the One for Kids! I am ever-so-grateful that Andrea Paulakovich messaged me just a few days after my beginning #DBC50Summer and jumped on board with me! Soon after her first post, she suggested copiloting this amazing flipgrid space! Thank you for letting me be part of this, Andrea! Book 42 is a book I had never heard of before my research in #DBC50Summer. It would make sense that I’d never heard of it though because it’s about Advanced Placement (AP) classes and my experience is at the elementary and just recently the middle school levels. I’m looking forward to reading this one through the eyes of a non-AP teacher and seeing what I can apply to my students in middle school. Also – the author, Andrew Sharos, is a HUGE inspiration to me on Twitter (I adore him) and I’m thrilled to finally reach his book! We’ve been counting it down for a while, and it’s finally time to take on All 4s and 5s!